This super cute homemade polar bear soap is easy to craft and makes a fun homemade Christmas gift. You can make these easy melt and pour soaps one at a time or double the recipe to make multiples for gift giving. Scent is optional plus the kids can join in on this soapmaking project. This yields one polar bear soap. Begin by weighing out 2.25 oz. of clear melt and pour soap base of your choice. (I used an Aloe Vera & Olive Oil Melt and Pour Soap Base .) Use a knife to cube the soap then combine in a glass Pyrex measuring cup and heat in the microwave just until melted. Carefully remove from the microwave – the glass will likely be hot! – and add three drops of the liquid blue soap color. Stir with fork then pour into one cavity of your mold. Spritz the top of the soap with alcohol to remove any air bubbles then allow to solidify at room temperature. Weigh out approximately 1.1 oz. of the white melt and pour soap and cut into small cubes. Arrange as desired on top of the solidified blue soap. Now weigh out 1.65 oz. more of the clear melt and pour soap base. Cube and heat in the microwave until melted. Add two drops of blue soap color and a pinch of white mica if desired. Stir. Spritz the top of the soap in the mold then slowly pour the soap onto and around the white soap chunks to suit. 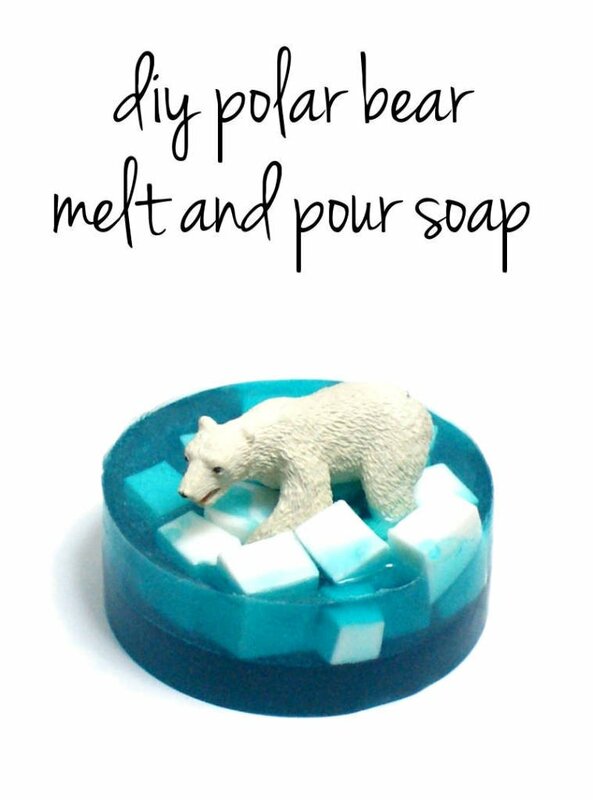 Place the polar bear on top of the white soap chunks with his feet in the blue soap you just poured. Now spritz the top of the soap once again with alcohol to remove any air bubbles. Allow the soap to harden completely then carefully remove from the mold. Wrap your homemade polar bear soap as desired for homemade Christmas gifts or stocking stuffers. 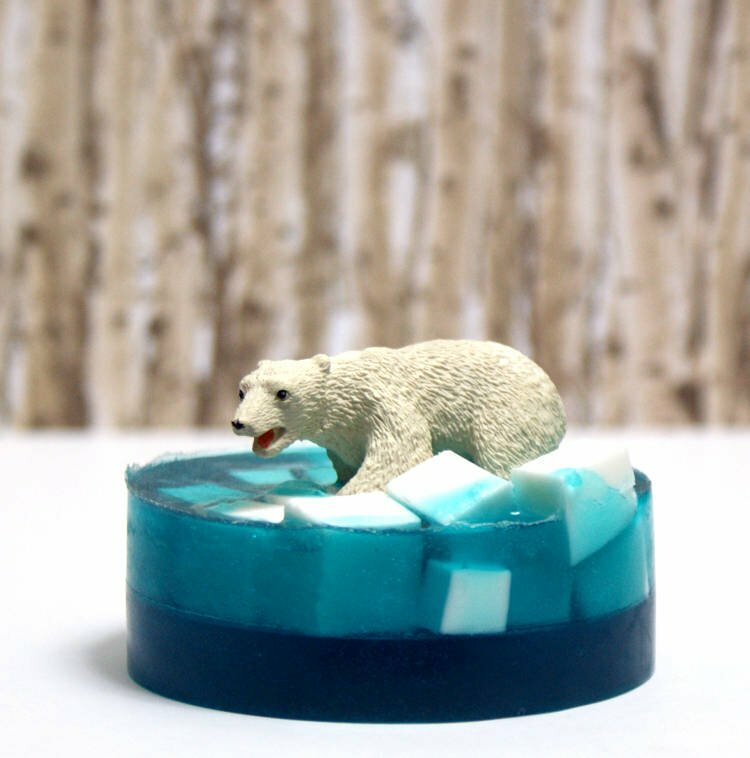 Want your polar bear soaps scented? Simply add a skin safe fragrance oil to your bases at up to 3% of the weight or around .5% for essential oils. Also be sure to use this same mold to make easy melt and pour loofah soaps with my tutorial here. Or try my melt and pour soap crystals project here. For more homemade Christmas gift ideas like this one be sure to follow my boards on Pinterest. You can also find and follow me on Blog Lovin’, Facebook, Twitter, Tumblr and Instagram. I totally love this idea. My son is smitten with polar bears. I wonder if I can sneak one away to make this.